One of the major benefits of flying higher, is that you get to descend for a longer distance, using less fuel, and typically at a faster speed across the ground. But taking advantage of these longer descents takes a little planning. If we consider an aircraft that would descent at 200 knots from FL250 down to an approach altitude of 3000’ MSL, we have a long ways to descend and if we complete this at a comfortable 500’ per minute descent, it would take a 153 miles over 44 minutes to complete the descent. This descent is longer than many cross-country flights that pilots in smaller light general aviation aircraft fly! 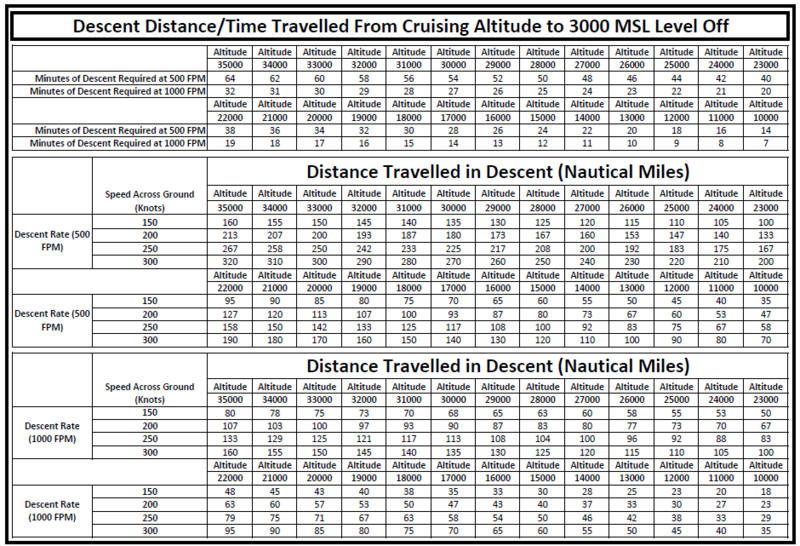 To put this in perspective, I have include here a chart that show descent rates of 500’ per minute and 1000’ per minute from various flight altitudes to demonstrate the mileage and time it would take to complete these descents. The link to the right is a tool on this website that you can use to calculate descent considerations that are outside the traditional 500 and 1000 FPM descent rates or for different ground speeds. Play with this a little to get a feel for results of different combinations specific to the aircraft you fly. The relevance of this to pilots flying higher altitudes is that they are going to have to plan their descents further out than they may be used to doing. And it is a little more relevant in a piston engine aircraft than in a turbine aircraft due to the potential for shock cooling of engines if prolonged and steep descents are conducted at low power settings. To avoid this, the pilot must begin the descent early. Sometimes, this is difficult to accomplish when coordinating with ATC. ATC is in many instances used to pilots flying aircraft at higher altitudes being turbine powered and being able to execute descents of greater rates, upwards of 1500’ or even 2000’ per minute that allows them to complete a descent in a shorter distance than may be advisable in a piston aircraft. Considering this, a piston pilot flying at higher altitudes should plan ahead and advise ATC when they would like to begin a descent to their arrival airport. Onboard equipment such as GPS systems can help calculate the required descent distances based on a desired descent rate when used properly. By planning ahead, a pilot can minimize any potential damage that could be the result of expedited descents over shorter distances or avoid any need to be vectored away from an airport to accommodate for a need to descend if ATC did not allow the pilot to descend far enough away from the airport. Additionally, when a pilot plans for a long descent, it allows them to descend at a lower power setting, burning less fuel, while many times increasing the speed across the ground which increases overall fuel efficiency over a route. Coasting downhill will speed up the leg and burn less gas!